November 16, 2008 "Truthdig" -- - We live in two Americas. One America, now the minority, functions in a print-based, literate world. It can cope with complexity and has the intellectual tools to separate illusion from truth. The other America, which constitutes the majority, exists in a non-reality-based belief system. This America, dependent on skillfully manipulated images for information, has severed itself from the literate, print-based culture. It cannot differentiate between lies and truth. It is informed by simplistic, childish narratives and clich�s. It is thrown into confusion by ambiguity, nuance and self-reflection. This divide, more than race, class or gender, more than rural or urban, believer or nonbeliever, red state or blue state, has split the country into radically distinct, unbridgeable and antagonistic entities. There are over 42 million American adults, 20 percent of whom hold high school diplomas, who cannot read, as well as the 50 million who read at a fourth- or fifth-grade level. Nearly a third of the nation�s population is illiterate or barely literate. And their numbers are growing by an estimated 2 million a year. But even those who are supposedly literate retreat in huge numbers into this image-based existence. A third of high school graduates, along with 42 percent of college graduates, never read a book after they finish school. Eighty percent of the families in the United States last year did not buy a book. It is precisely that kind of paid speech, which Mr. Clinton delivered 54 times last year for a total of $10.1 million in fees, that has complicated the vetting process that Mrs. Clinton is undergoing by the Obama transition team. 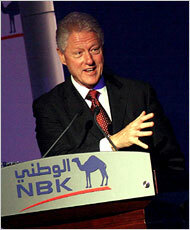 �Whatever happens or doesn�t happen is between Obama and her,� Mr. Clinton said. It is with a great pleasure that I offer you my heartfelt congratulations on your historic election victory. This is indeed a proud moment not just for America, but for millions of others around the globe who have come to believe in and aspire for the kind of values that have become universally acknowledged as the hallmarks of American society. Your success is a remarkable reminder of the potential for promoting major change through the ballot box in a free and fair electoral process. The prospect for change as promised by you has already aroused a great deal of expectation from people everywhere who are hopeful of emulating your example by constructing societies based on peace, freedom, justice and opportunity. No where is the desire for such change greater than in my homeland, Iran. The people of Iran are perhaps amongst the most eager aspirants for the kind of values that have become synonymous with your success in the recent months. Iranians believe �that if allowed the opportunity, yes they will�. It is their hope that with your moral and vocal support, they too can pursue their struggle for the realization of their individual liberties and fundamental freedoms along with the restoration of their pride and dignity as human beings. It is necessary to bring to your notice that if the Mullahs were civilized enough to hold dialogues with, 30 years would not have passed, hundreds of thousands of Iranians and other innocent people around the world would not have been sacrificed to the alter of the Khomeinist Islamo-Imperialist revolution, and generally the world would not be in the shape that is finds itself in, right now. You should be wise & careful enough not to be dragged into a trap spread by some shady so-called Iran Lover lobbyists, agents, spies, promoters and apologists. Democratic sources tell ABC News that President-elect Obama appears to be turning to two retired four-stars for his National Security Adviser and his Director of National Intelligence. Marine Gen. James L. Jones (Ret. ), the former head of NATO and U.S. forces in Europe, has emerged as the leading candidate to serve as the National Security Adviser for President-elect Obama. Admiral Dennis C. Blair (Ret. ), former Commander-in-Chief of U.S. Pacific Command and a 6th-generation naval officer, has emerged as the top candidate to be President-elect Obama's Director of National Intelligence. He recently met in Chicago with the president-elect. Neither job has been officially offered or accepted, and the Obama Transition Team would not confirm or deny either man's front-runner status. ABC News has also learned that during this transition period in which he's assembling his Cabinet, Obama is listening to advice from Gen. Brent Scowcroft (Ret. ), the former National Security Adviser for President George H.W. Bush, whose foreign policy Obama has said he admires. An appointment of a retired general to be National Security Adviser would be in the Scowcroft model. (CNN) -- President-elect Obama is on track to nominate Sen. Hillary Clinton as his secretary of state after Thanksgiving, three aides on Obama's transition team told CNN Thursday. Defense Secretary Robert Gates is being talked about as staying on in an Obama administration. 1 of 3 Clinton senior adviser Philippe Reines repeated a statement that "any and all speculation about Cabinet or other administration appointments is for President-Elect Obama's transition team to address." CNN also has learned that Obama is getting foreign policy advice from an unlikely source: Republican Brent Scowcroft, who was national security adviser in the first Bush administration. Two sources familiar with the conversations confirm to CNN that Obama reached out to Scowcroft for phone chats even before he ran for president, and the back-and-forth has continued in recent days as the president-elect assembles his Cabinet. Scowcroft is very close to current Defense Secretary Robert Gates, who is rumored to be in the running to stay in the Cabinet for at least an interim period at the start of the new Obama administration. The Army of Muhammad is back. This was the message buzzing in radical Islamist circles yesterday as the world tried to absorb the shock of the terrorist attacks in Bombay , India 's economic capital. The Bombay attacks differed from previous terror operations in India in a number of ways. In the past, one approach had been to place explosive-packed devices in crowded places with the aim of killing large numbers at random. Another was suicide attacks on specific targets by lone "volunteers for martyrdom". This time, however, the approach was "symphonic", in the sense that it involved different types of operations blended together. This consists of separating the "outsider", in this case the British and American "infidel", from the community with the intent of blaming them for the ills of the world before sacrificing them. It was no accident that one of the places attacked was a Jewish centre, where gunmen seized a rabbi and several members of the congregation as hostages. All the time, the intention is to terrorise the largest number of people, eroding the ordinary man's confidence in the ability of the authorities to protect him, and, in the long run, persuading a majority of the people, who just want to live their lives, to trade their freedom for the security that the terrorist promises in his utopia. Although new to India , the tactic of "symphonic" attacks has been tried in a number of other countries in the past decade, notably Algeria , Iraq and Saudi Arabia , at times with devastating effects. Most recently, it was tried, on a smaller scale, by the Taliban in the Afghan city of Qala-Mussa . Theoretically, the tactic could be used in any city, from Bombay to New York , passing through London and Paris . On Wednesday, it was obvious that India 's various anti-terror units were surprised, unable to cope with methods of operations not mentioned in their manuals. So far the only claim of responsibility has came from a hitherto unknown group using the name the " Deccan Mujahedin". The attacks came 48 hours after Pakistan's new president, Asif Ali Zardari, practically threw away 50 years of Pakistani policy by announcing his readiness to end the dispute with India over Kashmir. Zardari is an ethnic Baluch who, unlike previous Pakistani leaders who had Indian backgrounds, has no direct family history in pre-partition India . As a result, he is not as sensitive on Kashmir as his predecessors. The Bombay attacks could be a message to Zardari that, though he may be uninterested in Kashmir, the issue is still central to many in Pakistan . The new label used may also be significant. Deccan, a region in south-central India , was the intellectual and cultural capital of Indian Islam for centuries. By using the term " Deccan Mujahedin", the terrorists may be trying to pass two messages. First, that the Islamist movement is no longer interested only in Kashmir but intends to strive for the reconquest of the whole of India for Islam. This runs in line with the new pan-Islamist thinking that propagates the will to recover all lands once ruled by Muslims � from India to Spain and southern France , passing by Siberia, parts of Russia and the Balkans. " Deccan " designates a movement that has universal aspirations precisely because it claims local roots. This started to form more than a decade ago after Hindu nationalists won power in New Delhi through the BJP and its radical anti-Muslim allies. The Islamist terror movement has adopted what is known as the Matryoshka method, after the Russian dolls nested one into another. The outer and bigger doll in this case is the Students' Islamic Movement of India (Simi), which claims millions of members. The need for a home-grown terror movement in India may have been further emphasised by the success of the US-led coalition in destroying virtually all Islamist training bases and safe havens in Afghanistan . With Pakistan also becoming inhospitable, partly thanks to Zardari's apparent determination to move his country close to both India and the United States, Indian Islamists are forced to look for training centres and safe havens at home. Many experts believe al-Qaeda has ceased to exist as an organisation, although it survives as a model and inspiration. Al-Qaeda's number two, the Egyptian-born Ayman al-Zawahiri, has been calling on militants to refocus their efforts on winning power in Muslim countries such as India , which is home to 150 million Muslims, and thus the largest "Muslim" country in the world, ahead of Indonesia . This is in contrast with Osama bin Laden's theory that the US and its Western allies must be prime targets because, if they fall, the world system they dominate will disintegrate, opening the way for Islam's final triumph. It is possible that al-Zawahiri's writings influenced the Bombay attackers. But it is unlikely that he and al-Qaeda had any direct role in planning or executing them. There are other reasons why India is targeted. Over the past five years, it has emerged as the largest aid donor to Afghanistan and the second most important backer of President Hamid Karzai's regime after the US . The buzz in jihadist circles is that once the US and its allies have left, India will emerge as the principal foreign power behind the new democracy in Afghanistan . India is already playing a leading role in training and equipping the new Afghan army and police. India has also moved from its traditional anti-Americanism to a new policy of close friendship with the US . Earlier this year, India signed a landmark nuclear co-operation agreement, paving the way for massive purchases of American military hardware in the future. In jihadist circles, the new Indian economic boom is often described as the "House of the Spider", a reference to a sura of the same name in the Koran, Islam's holy book. On Wednesday, the attackers may have wished to show the flimsy nature of the "House of the Spider" by attacking Bombay , the engine of India 's economic transformation. Amir Taheri is author of 'Holy Terror: Inside the World of Islamic Terrorism'. His new book, 'The Persian Night', will be published next month. CHICAGO � President-elect Barack Obama picked a national security team headed by former campaign rival Hillary Rodham Clinton and Bush administration holdover Robert Gates on Monday, and said he wants to consult with military commanders before settling on a firm timetable to withdraw U.S. combat troops from Iraq. Obama named Clinton, a New York senator, as secretary of state and said Gates would remain as defense secretary, a post he has held for the past two years. At a news conference, the president-elect also introduced retired Marine Gen. James Jones as White House national security adviser, former Justice Department official Eric Holder as attorney general, Arizona Gov. Janet Napolitano as secretary of homeland security and Susan Rice as ambassador to the United Nations. "I assembled this team because I am a strong believer in strong personalities and strong opinions," he said. For years, the U.S. State Department has called the Islamic Republic of Iran the world�s "most active state sponsor of terrorism," For years, U.S. officials say the Islamic Republic of Iran has continued to provide funding, weapons, training, and sanctuary to numerous terrorist groups based in the Middle East and elsewhere, posing a security concern to the international community. And for years, the U.S. Administration has been unable to outdo the Islamic Republic�s propaganda machine and clearly has been unable or perhaps unwilling to help the Iranian people to end this nightmare in Iran. President George W. Bush, of all U.S. presidents, at his annual State of the Union addresses, spoke numerous times about the plight of the Iranian people. He once said, "If the Iranian people stand for themselves, the United States will stand with them." Throughout his presidency, the Iranians, of all people, hailed this courageous president, as an angel of freedom and his popularity was surging in Iran while his approval rating at home was going down. Honorable Mr. President Sarozy, we thank you for your supportive remarks in line with Iranian people's will, we admire your support. Honorable President Sarkozy, I would like to express my sincere appreciation, on behalf of all Iranians around the world. Your remarks, not sitting or shaking hand with A terrorist supporter like of Ahmadinejad, apart being refreshing is appreciated by millions of Iranians, in and out side of Iran. Happy 60th anniversary of the Universal Declaration of Human Rights. As an Iranian-born Canadian, I would like to thank you for making the distinction between Iranian citizens and the leaders in power who do not represent their voices. More leaders like you should take a stand and refuse to collaborate with officials of this un-democratic repressive regime that violates the rights of Iranians on a daily basis. Please also pressure Iran to Stop Child Executions. There are currently 140 children on death row in Iran despite the fact that Iran has signed the UN's ICCPR and CRC. Iran has summoned the French ambassador in Tehran over comments made by the French president about his Iranian counterpart, Mahmoud Ahmadinejad. 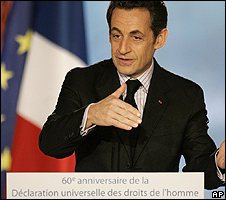 Nicolas Sarkozy said earlier this week that he would not be able to shake hands with someone who said Israel had to be wiped off the map. Ambassador Bernard Poletti was told of Iran's strong objections. He was told there would be repercussions for relations if such remarks were repeated. How is it that a people such as the Iranian people have the misfortune of being represented as they are today by some of their leaders? "How is it that a people such as the Iranian people - one of the world's greatest peoples, one of the world's oldest civilisations, sophisticated, cultured, open - have the misfortune of being represented as they are today by some of their leaders? "I have said this to my friend Kofi [Annan]: I find it impossible to shake hands with somebody who has dared to say that Israel must be wiped off the map. "I know perfectly well that we must resolve what is perhaps the most serious international crisis we are having to resolve: that of Iran moving towards a nuclear bomb. "We cannot resolve it without talking to Iranian leaders, but, after what was the Shoah, after what was the 20th Century, I cannot sit at the same table as a man who dares to say: Israel must be wiped off the map." The Iranian president has repeatedly called for an end to the Israeli state and has described the holocaust as a myth. In October 2005, the Iranian president made a statement in which he envisaged the replacement of Israel with a Palestinian state. Thank you President Sarcozy; for having the balls to tell the truth; unlike many other coward world leaders. Preparing to board a train for his ride to the nation's capital, Obama said that "what's required is a new declaration of independence � from ideology and small thinking." 14. Complete separation of religion and State. 20- Rejecting any policy that is ignoring Human Rights, Free Society and Secular Democracy for interest in Blood for Oil. 21- Rejecting any policy which is ignoring Global Warming. 5. 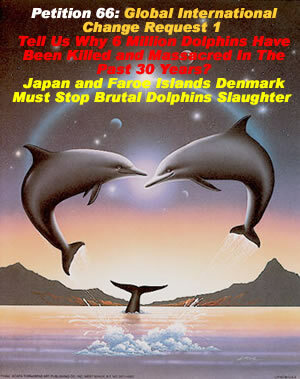 Why should we promote Dolphin Rights to the same level of Human Rights? Crowds gather on the National Mall in Washington for the swearing-in ceremony of President-elect Barack Obama on Tuesday, Jan. 20, 2009. President-elect Barack Obama and his wife, Michelle, have arrived at the White House. They were greeted outside by President Bush and first lady Laura Bush. Vice President-elect Joe Biden and his wife, Jill, joined the Bushes and Obamas. An estimated 2 million supporters have gathered in Washington to watch as Obama takes the oath of office at noon as the nation's first black president. Speaking at his inauguration, Obama signaled a break with former President George W. Bush�s anti-terrorism strategy, criticized as too reliant on military force and rough interrogation tactics. The U.S. can face down threats �not just with missiles and tanks,� nor by suspending America�s ideals �for expedience�s sake,� Obama said. America�s �power grows through its prudent use,� he said. Obama had one of the most expensive & secretive campaigns in the US history, to this date, they will not disclose the name of their contributors. Now, he has the most expensive "Coronation"/Inauguration! in the US history, 150 million dollars. You would think, with this economy this money could have been put to a better use. President Barack Obama's choice for spy chief, Dennis Blair, said Thursday that U.S. intelligence agencies should seek ways of working with Iran on issues of mutual interest, underscoring the new administration's interest in engagement with elements in the Islamic state. "While policymakers need to understand anti-American leaders, policies and actions in Iran, the intelligence community can also help policymakers identify and understand other leaders and political forces, so that it is possible to work toward a future in both our interests," retired Admiral Blair said on Thursday in a prepared statement for a Senate hearing on his nomination as Director of National Intelligence. Blair also backed Obama's decision to close Guantanamo prison and said humane treatment standards for terrorism suspects must apply throughout the government, breaking with the Bush administration's insistence on an exemption for the CIA. "There must be clear standards for humane treatment that apply to all agencies of U.S. government, including the intelligence community," Blair said.